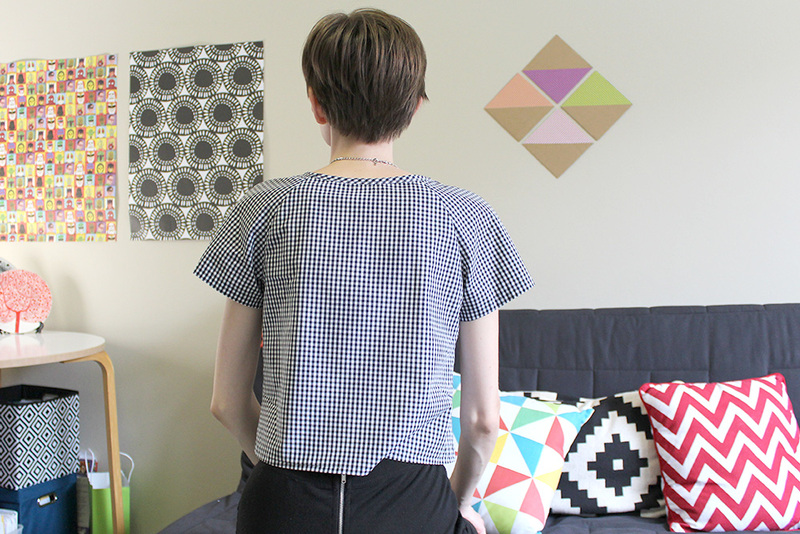 I made a loose woven tee! As usual I had to ham it up for the cameras and play dress ups with my new tee, please forgive me, it’s all in fun! I think this is a good top for wearing with skinny jeans or tight fitting bottoms, the loose fit of the top makes it a bit more relaxed and I guess ‘demure’. 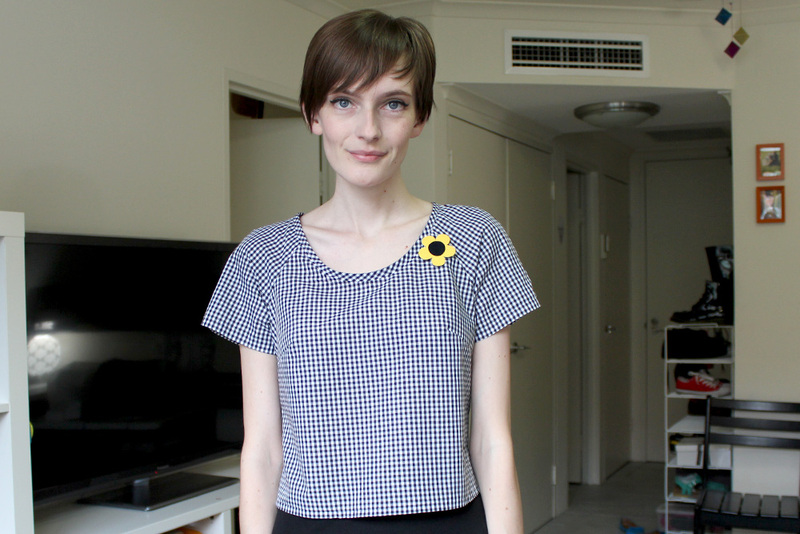 The top goes with a lot of accessories…Gingham is practically a neutral right? well I’m sure that’s debatable! 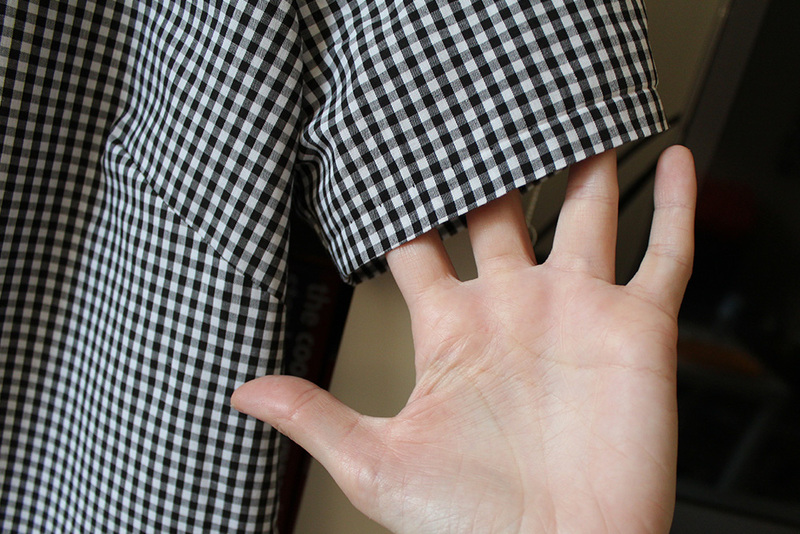 Above: I did an invisible hem on the sleeves and the bottom of the top. Still obsessed with my invisible hem foot! Above: up close and personal with my tee! 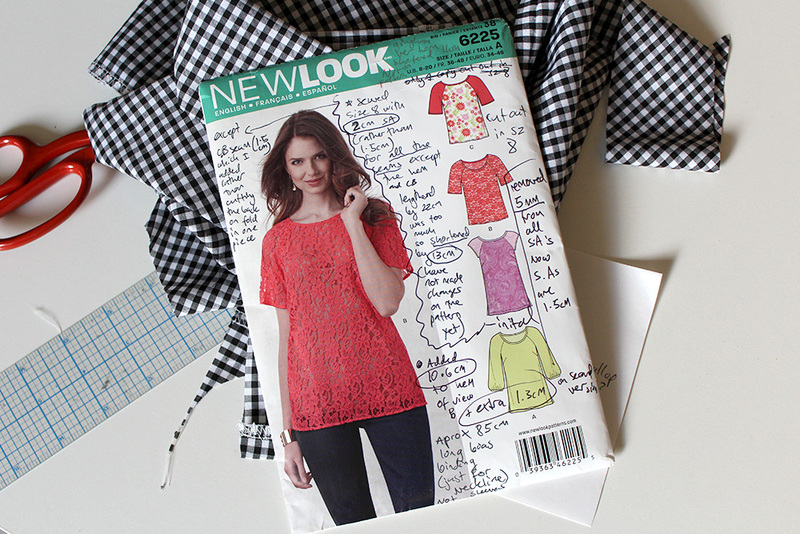 Sewing notes: The original plan was to make a shift dress using the pattern New look 6225, which was the same pattern as i used for this dress. I thought this quick project would be a fabulous antidote to drama I had with my Mad Men Megan dress. LOL have a look at my pattern notes (perhaps I need a better system)…. I remember transfering all the alterations/changes to the pattern tissue, the last time I made this dress, but somehow the fit was looser and it came out a lot more boxy than I wanted it to! Unlike my first shift dress using new look 6225, this one does not not have a CB seam (but that’s what the pattern intended) perhaps that had an effect on the fit? I always intended this fabric to be a shift dress but I tried it on and it looked like hospital scrubs (not cute). So I thought “wow I better shorten it!” -That’s when I went far too crazy and shortened it too much. It seem’s to be a mistake I often make. 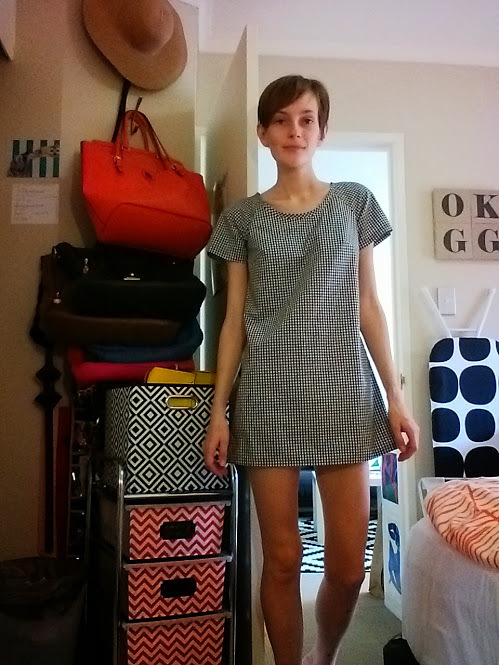 I like short dresses but this is too short. It was that weird no-mans land between ‘top’ and ‘mini dress’, just covering the bum. I could either add a contrasting band to the bottom or shorten it into a top. 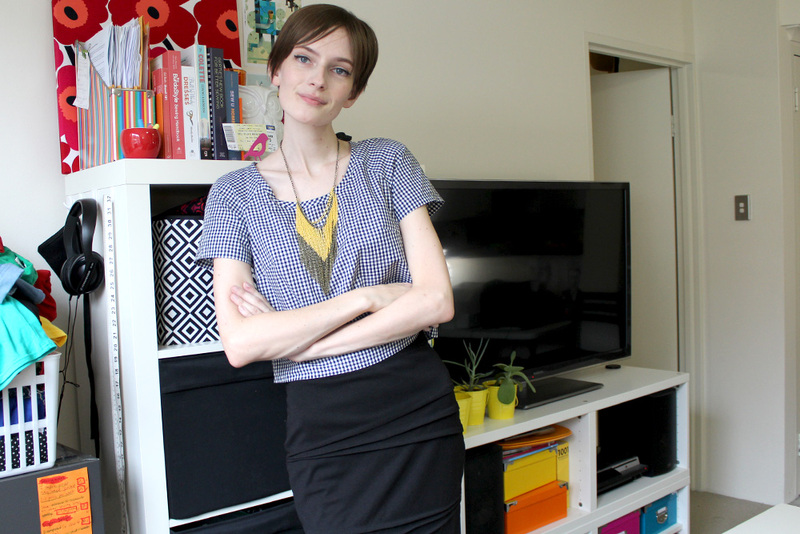 I’m so glad I shortened it and made it into a top, because this top goes with almost anything! 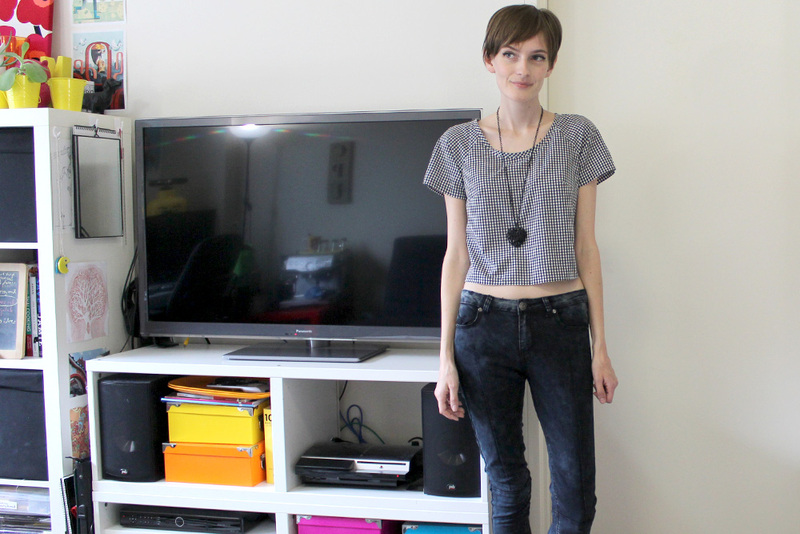 I like how it’s slightly cropped, but its still a little modest because of how loose it is. 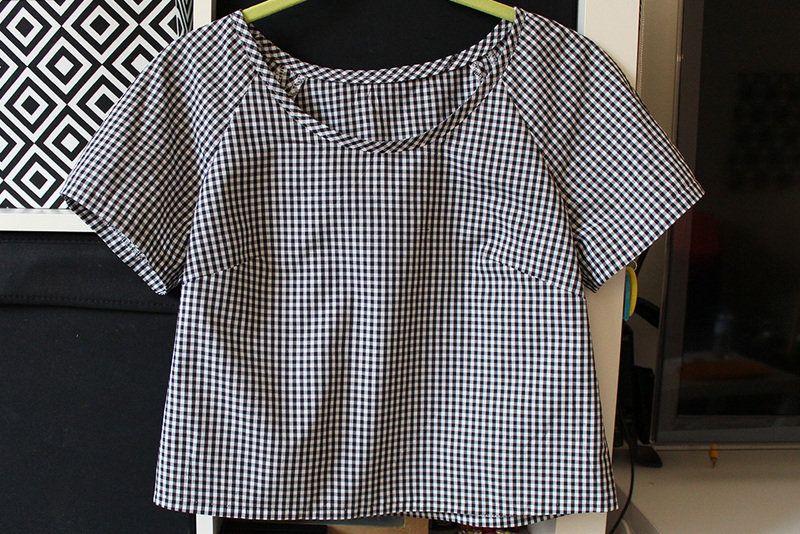 I cut this dress/pattern some time ago, but I decided to time my sewing. It took about 3.50 hrs (not inc cutting time), then an additional 2 hrs when I umed and erred over shortening it for the 3rd time. That was a crazy long winded post for such a simple project, need to learn to edit!